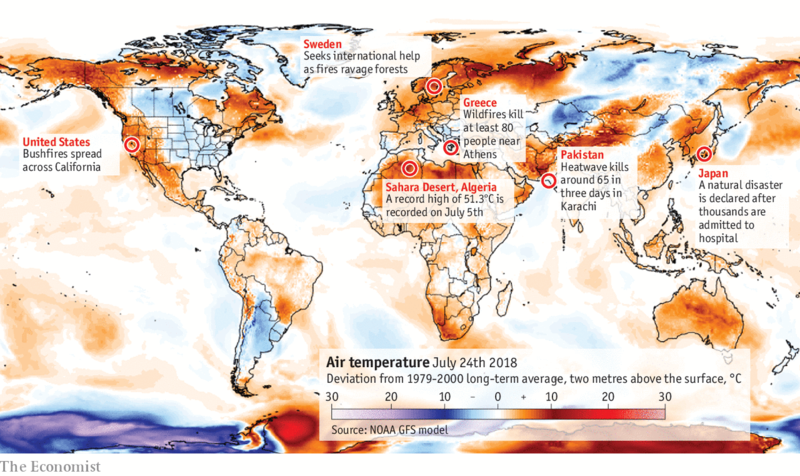 …Heat is causing problems across the world… – A Nibble – A Bite – or a Meal! SODANKYLA, a town in Finnish Lapland just north of the Arctic Circle, boasts an average annual temperature a little below freezing. Residents eagerly await the brief spell in July when the region enjoys something akin to summer. This year they may have wished for a bit less of it. On July 18th thermometers showed 32.1°C (89.8°F), which is 12°C warmer than typical for the month and the highest since records began in 1908. But Sodankyla is not the only place that is sizzling. have killed at least 80 people near Athens. Sweden has suffered a rash of forest fires, sparked by unusually hot and dry weather. Britain and the Netherlands look more parched than they did in 1976, one of the driest summers on record. Some 80,000 hectares of forest are burning in Siberia. Japan has declared its heatwave to be a natural disaster. On the night of July 7th, the temperature in downtown Los Angeles did not drop below 26.1°C. That seems positively nippy compared with Quriyat in Oman, which recorded a 24-hour minimum temperature of 42.6°C a few days earlier. Heatwaves bring problems, especially in the developing world. Crops are ravaged, food spoils and workers become less productive. Studies have linked rising temperatures to violent crime and civil strife. And heat can kill on its own. 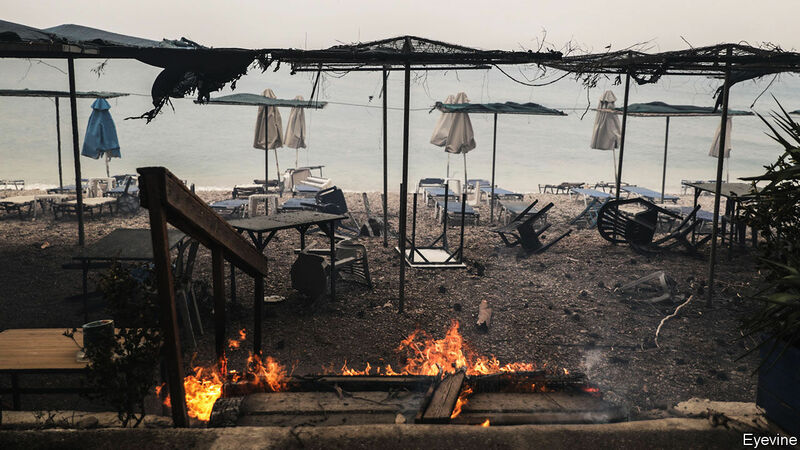 In 2003 more than 70,000 Europeans may have died as a direct result of an infernal summer. That was seen as a once-a-millennium heatwave at the time. By comparison, notes Geert Jan van Oldenborgh of the Royal Netherlands Meteorological Institute, outside of northern Europe the summer of 2018 looks unremarkable, so far, in terms of temperature. The Netherlands, for instance, can expect scorchers every couple of years. Except, he adds, a century ago that might have been once every 20 years. A few years back, a team led by Peter Stott of Britain’s Met Office calculated that, by 2012, summers like the one in 2003 would be expected to occur not every 1,000 years but every 127. No consequence of global warming is as self-evident as higher temperatures. Earth is roughly 1°C hotter today than it was before humanity started belching greenhouse gases into the atmosphere during the Industrial Revolution. If this so-called thermodynamic effect were all there was to it, temperatures now considered unusually hot would become more typical and those regarded as uncommonly cold, uncommoner still. But climate being a complicated thing, there is more to it. Weather patterns can change because the colder poles warm faster than balmier lower latitudes. As the thermal difference between the two diminishes, so does the velocity of the jet stream, a westerly wind which blows at an altitude of around 10km. That means the weather it carries can stay in place for longer. Sometimes, it offsets the thermodynamic effects, leading to cooler temperatures than might be expected. Often, it amplifies them. When and by how much is a matter of hot debate among climate scientists. It is hard to pin any particular heatwave, drought or flood on the effects of man-made pollution. Freak events happen; the highest temperature ever recorded on Earth was 56.7°C in Death Valley, California, but that was on July 10th 1913, when concentrations of carbon dioxide in the atmosphere were much lower. By using clever statistics to compare the climate’s actual behaviour with computer simulations of how it might have behaved in the absence of human activity, researchers can calculate how mankind has made a particular weather event more likely. The first such study, co-authored by Dr Stott in 2004, found that the likelihood of the 2003 European summer had doubled as a result of human activity. Since then similar “event attribution” research has burgeoned. A year ago Carbon Brief, a web portal, identified a total of 138 peer-reviewed papers in the field, covering 144 weather events. Of 48 heatwaves, 41 contained humankind’s imprint in the data. More studies have appeared since then. World Weather Attribution, a website run by Dr van Oldenborgh and Friederike Otto of Oxford University, posts a new one practically every month. Besides scrutinising past weather, many of the studies look ahead—in particular at how the likelihood of future extreme events changes depending on how seriously countries take their commitment in Paris in 2015 to limit global warming to “well below” 2°C relative to pre-industrial levels (and better yet, to no more than 1.5°C). The picture that emerges is bleak. One study, published in June by Andrew King of the University of Melbourne and his colleagues, found that the number of Europeans who can expect to witness a temperature above the current record, wherever they happen to live, would double from 45m today to 90m if the planet warmed by another 0.5°C or so on top of the 1°C since the 1880s. If, instead of 0.5°C, it warmed by 1°C, the figure would rise to 163m. This looks even more alarming if you factor in humidity. Human beings can tolerate heat with sweat, which evaporates and cools the skin. That is why a dry 50°C can feel less stifling than a muggy 30°C. If the wet-bulb temperature (equivalent to that recorded by a thermometer wrapped in a moist towel) exceeds 35°C, even a fit, healthy youngster lounging naked in the shade next to a fan could die in six hours. At present, wet-bulb temperatures seldom exceed 31°C. In 2016 Jeremy Pal of Loyola Marymount University and Elfatih Eltahir of the Massachusetts Institute for Technology found that if carbon emissions continue unabated, several cities in the Persian Gulf, including Abu Dhabi and Dubai, could exceed wet-bulb levels of 35°C by the end of the century. A follow-up study reckoned that, by 2100, parts of South Asia, which is much more populous than the sheikhdoms and a lot poorer, could suffer a wet-bulb level of 34.2°C every 25 years. The effects could be devastating. The World Bank has warned that rising temperatures and changing monsoons could cost India 2.8% of GDP per person by 2050 and affect the living standards of 600m Indians in areas identified as hot spots. The global cost of productivity lost to heat has been estimated at $2trn by 2030. The toll on human lives is hard to imagine. But at least people can learn from past mistakes. Thanks to better government responses, particularly in care for the elderly, in 2012 Europe survived a summer hotter still than 2003 with fewer casualties. As Indians get richer more will be able to afford air-conditioning; even those in shantytowns can paint their corrugated-iron roofs white to reflect sunlight. If only the world could take in a similar lesson about the importance of stopping climate change in the first place.